Quinoa [keen-wa] is an experimental crop for us, but that doesn't mean we can't be successful with it. One key is to plant this 'mother grain' of the Incas early, around the first week of May - late April would be even better, if possible. Plant seed in shallow furrows 6 - 12 mm (1/4 - 1/2 in) deep, cover, tamp and wait for rain. If the soil is damp there may be enough moisture for germination. Rows should be a minimum 35 cm (14 in) apart. From the seedling stage onward quinoa resembles lambsquarters, to which it is closely related and which should be weeded out to prevent cross pollination. 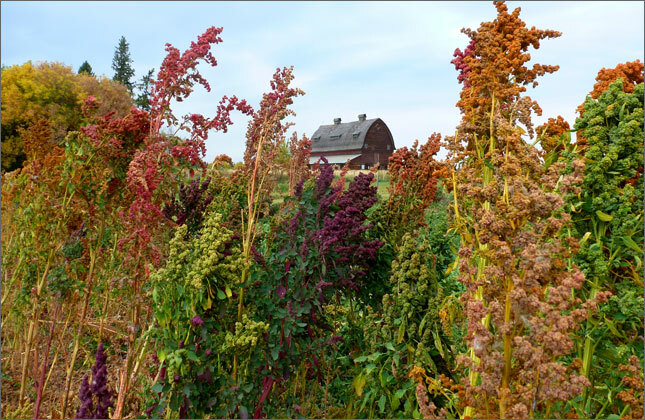 Quinoa likes full sun and can grow to 1.8 m (6 ft) or more if thinned and weeded. Eat the leaves of thinned quinoa in salads or cooked like spinach. Rainbow takes on colourful orange, pink and red hues as it matures. Harvest in September when there is at least some dry seed - cut the stalks and spread them on a clean sheet to dry in a rodent proof area. Small lots can be hand processed by rubbing seed out of the heads, then screening out over and under sized trash, followed by winnowing. Quinoa seed must be rinsed to remove bitter saponins before being cooked. Nutritionally superior to most other grains and pseudocereals, quinoa cooks in 20 minutes, triples in volume - and makes a great tabouli.